You Know You’re a Blogger if……. I wanted to share with you blogging tips that I have learned throughout my blogging and e-zine journey. They may come once a week, once a month or even twice a week. I am not sure, I will just go with the flow on this. Be rest assured, that I am still learning right along with you! Even though we are an e-zine not a blog I did dabble in the blogging world before diving into the E-zine world. Actually, I still blog for myself and my family when I have time, which means not often. 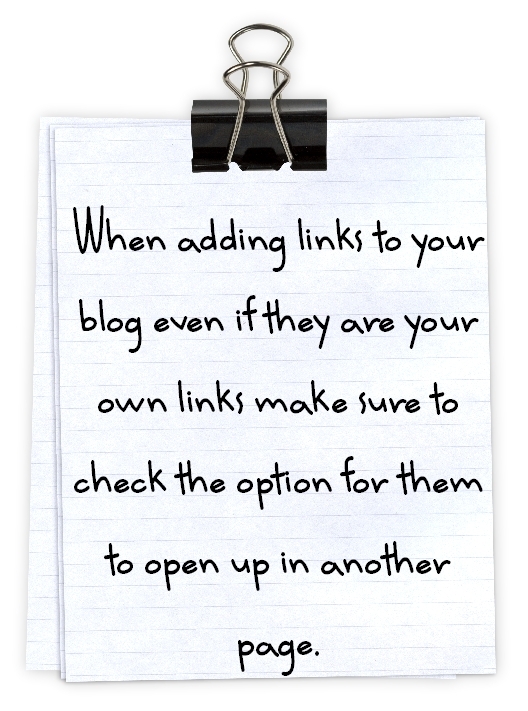 The above tip is something I see newbie bloggers and even from those who have been blogging for years, do. If most bloggers are anything like me, when I click on a link and it takes me to another blog this is how I get “oooh, ahhhh, I want to see how she did that, oh wait, I want to pin that…” Before I know it, I forgot that I was ever on your blog. You lost a reader, not because their content was better but because one can easily get distracted when surfing the internet. Now onto some blogging humor: What would you add to the “You know you’re a blogger if….? « If you subscribe via Email or Facebook you may have won! You know you’re a blogger when you have been away from the computer for 1/2 the day and you can’t wait to read the comments people have left you. Yes, Nice comments are always a pleasure to read! Ha -this is hilarious but so true. Thanks for the smiles! Kyra, I know right. LOL Thanks for stopping by! This is so true! Especially the part about not having met some of your closest friends! Yes, I can see how that happens. Esp. if you are in a tight blogging community. Those are hilarious!!! I totally do most of those. I would say, “You know you’re a blogger if you constantly think about how this could become a blog post…” I now take way more pictures (and different pictures) so that I can use them on my blog. ROFLOL!!! I am a very new blogger and even I can recognize myself. 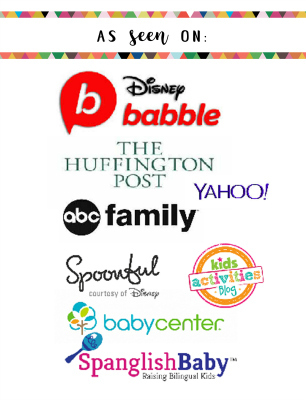 My oldest daughter asked me a question today and I said, “Didn’t you see my blog?? ?” ROFLOL!!! Hilarious! Yes, it doesn’t take long before you see yourself in that list. lol! Thanks for the grins. I see myself in htis post! Beth, I totally relate to the not letting guest or for that matter my children eat until I have taken pictures of the food. Glad I can laugh at myself. Nicole, I didn’t realize you could do that. I will have to try that b/c sometimes it’s annoying when I do want to go back to that persons blog but I have to keep hitting back on my browser or typing the address again. Good to know. Thanks for the tip about the links opening up in another window! I am doing it now! Omg! I am a new blogger and I thought it was only me:) Lol Love these:) Just popping over from One Artsy Mama to check this out:) I would love for you to share this at Freedom Fridays. So hoping to see you and you there! PS Still enjoying following you. 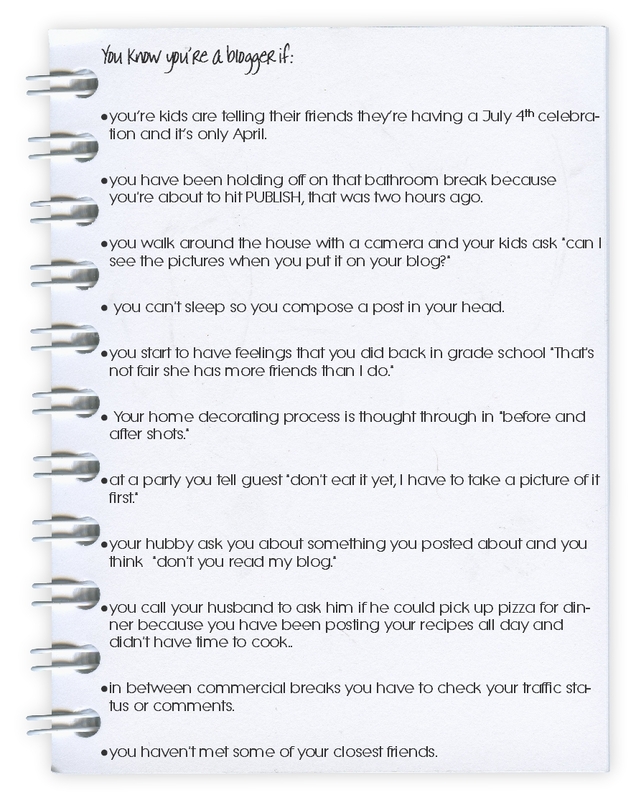 How funny to see so many of those instances are very true for bloggers! You know you’re a blogger when your family asks when you’re going to blog about a recent project..thanks for continuing to link up at Sunday Blog Love, this will be featured as one of my favorite posts for the week! Great fun! Thank you for the smile today and for sharing at WJIM. YOU KNOW YOUR A BLOGGER WHEN…..”you attend a function you normally would miss just to have someting to blog about!! !” ha! Love this Mari! Featured it tonight at Project Queen’s Highlight Party! Thanks for sharing. OMG! This is too funny and so true in so many ways! I think I can relate to almost all the points on the notebook! lol. This is killing me I am laughing so hard. Love it! 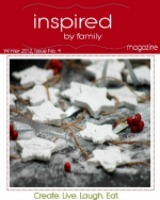 such a cute cute blog post!!! I love it! Andddd it is so true!